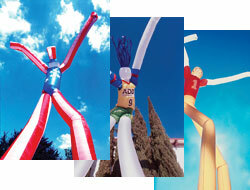 ﻿ TUBE DANCERS - Animated Advertising with GIANT Impact! 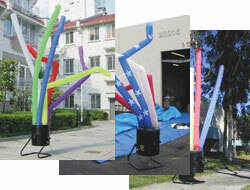 These tube dancers are all available with an Air Vortex fan that inflates the tube and keeps the character in motion. 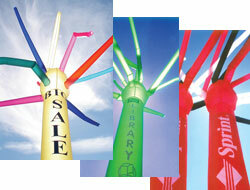 Filled with fresh air, no helium required! 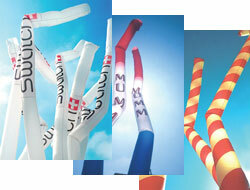 Made from outdoor coated rip-stop nylon material. 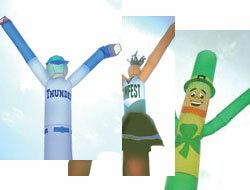 An exciting new way to demand attention, these lively tube dancers are available in many different styles. 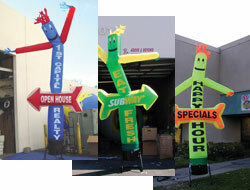 Available in sizes up to 60' tall, imagine their impact at a concert or sports event, not to mention their obvious appeal as a method to advertise in a BIG way. 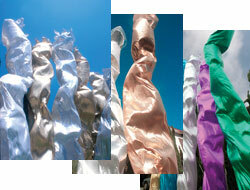 Some of our most affordable options, these dramatic characters grab attention from passers-by. Who can resist their crazy movement and colorful display? While you have their attention, you can make sure they notice your big event or message. An effective and positive way to make them look. Deliver a message with personality! Ideal for concerts and sports events! Custom designed with your logo!